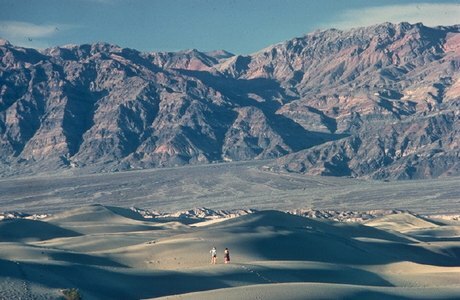 Death Valley National Park Description. Death Valley is a land of extremes. It is one of the hottest places on the surface of the Earth with summer temperatures averaging well over 100 degrees Fahrenheit. It encompasses the lowest point in the Western Hemisphere at 282 feet below the level of the sea, and it is the driest place in North America with an average rainfall of only 1.96 inches a year. This valley is also a land of subtle beauties: Morning light creeping across the eroded badlands of Zabriskie Point to strike Manly Beacon, the setting sun and lengthening shadows on the Sand Dunes at Stovepipe Wells, and the colors of myriad wildflowers on the golden hills above Harmony Borax on a warm spring day. Death Valley is a treasure trove of scientific information about the ancient Earth and about the forces still working to shape our modern world.